On Wednesday, February 17, 2010, three representatives from the Summit Toastmasters Club in Frisco were intereviewed live on the air. Local Vail Valley radio station, 97.7 KZYR the Zephyr has a weekly show called “Community Focus” which airs every Wednesday night. 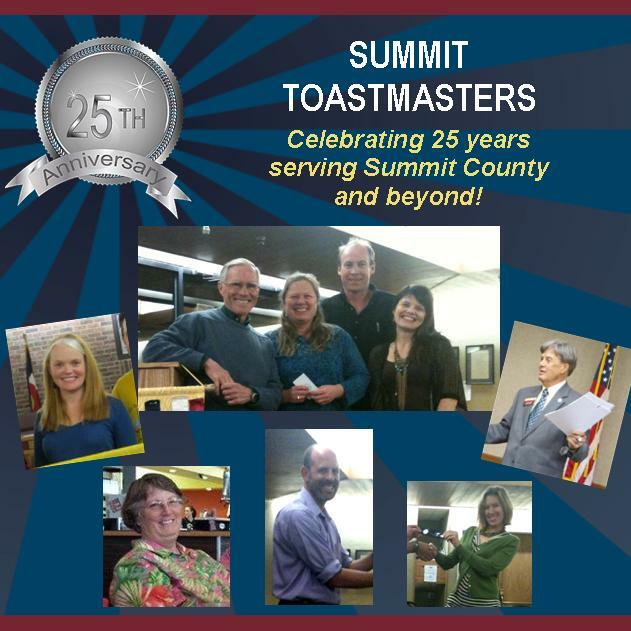 On Wednesday, February 17, District 26 Governor Alan Swartz, Summit Toastmasters Club President Ryan Hawkins and club member Amy Nakos were guests for the hour-long show with host Rohn Robbins. Three segments of 15-20 minutes each were broadcast. Robbins started the show by asking general questions about the Toastmasters organization. Swartz, Hawkins and Nakos were then asked questions on a variety of different topics, mostly relating to Toastmasters and speech in everyday culture. The interviewees promoted Toastmasters and the many varied benefits to the listeners. Also, the Vail Valley is going to be hosting a sample meeting in late March for interested people with the hopes of establishing a local club. Contact the webmaster for details. Also, video of the interviews is being replayed on Community Access Channel 18 in the Vail Valley. Another great meeting with lots of participation. We had a visit by our area governor Brian Lewis, area F-2. We have more new members as Mike Green and Yvonne Bryant have joined to bring us to 15 members. President Ryan Hawkins called the meeting to order. Alan Swartz was the Toastmaster and shared some of Toastmasters history. Our first club met in 1924 led by Ralph Smedley, a YMCA employee who started Toastmasters to improve speaking skills for young businessmen. For speakers we had David Maloley who spoke on “Cavity Creeps”, his 2nd speech. One interesting part was that he likes to get kids into the office before they have cavities in order to reduce the fear of being in the dentist office. He was evaluated by Fred Fife. Yvonne Bryant gave her icebreaker “Quincunx” which means the whole is greater than the sum of the parts. She described activities that broke her out of a perfectionist mode, including motorcycles and mountain bikes. What a creative speech for an icebreaker. She was evaluated by Mike Clement. The level of table topics continues to go up. Kevin Flewell brought letters to Dear Abbie which we used to try to respond. Pat Moore spoke on a woman moving to another state with her husband and afraid of being alone after her husband died in new territory. Fred Fife spoke about a woman called old lady by a fellow worker. Mike Clement spoke on my wife is addicted to the cell phone. Amy Nakos spoke on grieving from the loss of a son and how to handle it in conversation. Mike Green, a guest, talked about moving in with a girl friend. Macabre was the word of the day. Brian Lewis discussed the Area F-2 contest on 27 at 10:00 a.m. in Lakewood for the International Speech and Table Topics as well as our Distinguished Club Plan. Timer was Jim Shaw, Ah sessor/grammarian was Ryan Hawkins, and General Evaluator was Amy Nakos. Best speaker was Yvonne, Best table topics was Mike Green, and best evaluator was Mike Clement. Footnote: Amy, Ryan and Alan did an hour radio talk show and TV show in Edwards on Feb 17th. It went well with lots of questions on gestures, stories, pauses, speech construction, as well as the supportive atmosphere of Toastmasters. It should be broadcast on Vail cable. Tuesday, February 16, 2010. 6:30pm. Frisco Town Hall. What a great meeting with guests and new Toastmasters adding to the energy of the group. Ryan Hawkins, President, opened the meeting and was the Toastmaster at the Frisco Town Hall. Guests were Yvonne Bryant, Jurgita Christoffersen, Dan Bellina and Diane DeSilva. Speakers were Amy Nakos on an “Unexpected Love Affair” about the applications of her new I-phone. Amy continues to raise our speaking level. She was evaluated by Pat Moore. Mike Clement spoke on “Motivation” with humor and his friend who eloped to have a cheaper marriage. Find your passion if you want to find your motivation. He was evaluated by Kevin Flewell. Brian Baki gave his ice breaker on his experience as “little Brian”, meeting people and listening to their stories in Europe for 31 days. He was evaluated by Jim Shaw. David Maloley spoke on “Searing Experiences”about Nebraska, Germany, Italy(wine, flowers, and bread) and celebrating life in the Vail Valley. He was evaluated by Amy Nakos. Table topics were led by Kevin who used fortune cookies. Jim spoke on finding old friends, Alan on relationships with co-workers, Yvonne on a peaceful life, and Dan on recognition as a community leader. Jim was timer, Yvonne was grammarian, and Alan was general evaluator. Mike was named best speaker, Dan best table topics and Kevin best evaluator. Our next meeting is February 16th. Bring your competent leadership books and we will help everyone get started in those books during the meeting. Remember the radio show in Edwards is Feb 17th at 7 p.m. We can have three involved. Alan and Amy are currently planning to talk.